Wireless Sensor Networks is an essential guide for anyone interested in wireless communications for sensor networks, home networking, or device hacking. 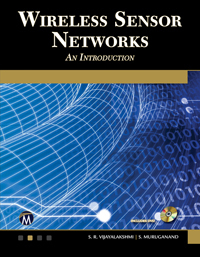 It covers a large number of topics encountered in the architecture, application, and recent advancements of a wireless sensor network, including hardware and software architectures, the Internet of Things, routing and security, MANETs, MEMS, Zigbee, TDMA, securing networks for Wi-Fi, ubiquitous sensor networks, underwater, mobile, and multimedia wireless networks. S. R. Vijayalakshmi, PhD and S. Muruganand, PhD teach courses in wireless communication and engineering and are the authors of Ocean Electronics (Mercury Learning and Information).